Boeing's CST-100 capsule (short for Commercial Space Transportation-100) is being designed to ferry astronauts to and from the space station and other destinations in low-Earth orbit. The spacecraft will initially launch from Florida atop United Launch Alliance's Atlas 5 rocket, but the company is not ruling out other booster options in the future, officials have said. The capsule is being designed as part of a NASA program that supports the development of a new fleet of commercially built spaceships to fill the gap made by the retirement of the shuttle program. "It's been an interesting last couple of years for us," Roger Krone, president of Boeing's network and space systems, told reporters this month. "I think many people in the industry associate Boeing with the shuttle program and the International Space Station. [This is] kind of a chance for us to rethink what our space strategy is." "We could launch as early as 2015, depending on funding, but the way the budget is laid out, it most likely will be 2016," Elbon said. Over the last two years, NASA's Commercial Crew Development program has divided $320 million among four American spacecraft builders: SpaceX, Blue Origin, Sierra Nevada and Boeing. 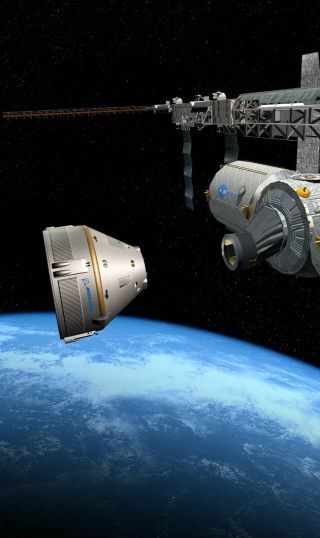 So far, the agency has awarded Boeing with approximately $120 million for the company's work on the CST-100 capsule. But funding for the program has been an ongoing challenge. In 2012, Congress gave just $406 million for commercial crew development in 2012, which was less than half of the $850 million originally requested by NASA. The bleak budget environment has already delayed NASA's first planned launch aboard a commercial spacecraft by two years, and the agency will likely face more financial constraints going forward. In its fiscal year 2013 budget, NASA has requested $830 million for the commercial crew program, but two bills that were recently approved in the House and Senate would set aside only $500 million and $525 million, respectively, for the agency to support the development of these new spaceships. A model of Boeing's CST-100 space capsule shows the crew-carrying craft's interior design. The CST-100, which can carry up to seven astronauts, could fly its first manned mission by 2015 or 2016, Boeing officials have said. Still, Boeing is forging ahead with the development of the CST-100. The capsule recently underwent a parachute drop test from a helicopter on April 3 at the Delamar Dry Lake Bed near Alamo, Nev.
"The CST-100 is set up to land in the desert on airbags," Elbon said. "On this test, we dropped from a helicopter and checked the deployment and operation of three large chutes." Boeing will conduct another test in early May to evaluate the performance of the parachutes that are designed to slow the capsule's descent after it re-enters Earth's atmosphere, he added. The gumdrop-shaped CST-100 spacecraft will be able to seat as many as seven astronauts. The capsule measures 14.8 feet (4.5 meters) across at its widest point and will be reusable for up to 10 flights, company officials have said. NASA is relying on commercial spaceships to eventually carry astronauts to and from the International Space Station. After 30 years and 135 missions, the agency retired the space shuttle program to focus on exploration beyond low-Earth orbit, such as an asteroid or Mars. The agency hopes to be able to pay for flights aboard American-made commercial vehicles by 2015, to close the current gap in human spaceflight. "Its role is to provide affordable transportation to the space station so there's money left in the budget to develop beyond [low-Earth orbit] capability," Elbon said. Boeing is also partnered with Nevada-based Bigelow Aerospace, which is developing commercially operated inflatable space habitats, and Virginia-based Space Adventures, a space tourism firm that intends to sell open seats on the CST-100 for paid jaunts to destinations in low-Earth orbit. These combined ventures should help Boeing develop a dynamic and viable business case, Elbon said. "There is significant potential for a commercial market to grow once transportation to low-Earth orbit is available," Elbon said. "There's definite interest there. It's certainly a doable thing to have [Bigelow's] customers, which are primarily countries that can't afford their own space programs. "Whether or not you can close a business case on that alone is something we haven't determined is a feasible thing if that's the only market we're going after. Transportation to the space station and allowing the commercial market to develop in parallel is something very workable," Elbon added. "I think if NASA was the only business, this wouldn't be such an exciting venture — it wouldn't be such an attractive business case." NASA dominated American human spaceflight for more than 50 years, but in the 21st century, private spaceflight companies are building new space taxis to launch more people into orbit. SPACE.com looks at the major players in the commercial spaceflight race in our week-long series: The Private Space Taxi Race. This is Part 2 in that series.